Chickpeas? Sounds gross, I know. But trust me. It’s a salty, crunchy, spicy snack. You’ll love it! Heat oven to 400. 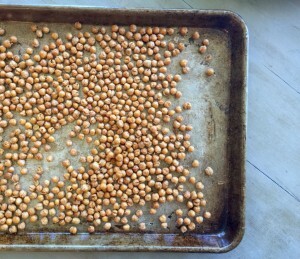 Drain the chickpeas in a colander and rinse well. Dry beans on a paper towel, If any of the skins come off, just discard them. Drizzle dry beans with olive oil and toss to coat. Sprinkle lightly with salt. Roast for 30 minutes or until beans are golden brown and crunchy. While they are hot, season with cajun seasoning and more salt (if necessary). Copyright © 2015 Our Everyday Dinners - This is an easy recipe for how to make Cajun Roasted Chickpeas.